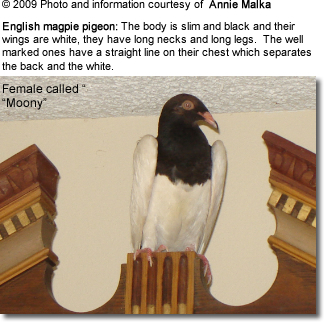 The Magpie is a fancy pigeon developed over many years of selective breeding. 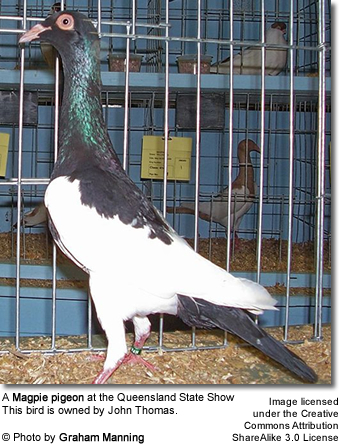 As many other domesticated pigeons, they are descendants from the Rock Pigeon (Columba livia). 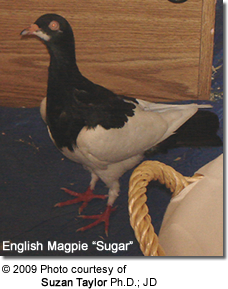 The original Magpie was one of the old tumbler varieties, coming via Germany from Denmark about 1900. In England, the Magpie was often called the "Queen of the Pigeons." The Magpie Pigeon is slender pigeon that stands erect, as the back is carried at a sharp angle upwards. The body - except head, neck and breast, back, saddle and tail - is white. The head, neck, breast, back, saddle and tail is black with an iridescent, metallic sheen. The cut on the breast should be sharp and evenly defined. The most sought-after Magpies are often the Blacks, but they appear in other colors including Yellow, Blue, Dun, and Silver. Blue and Silver mutations should have black tail bars. The beak is long and flesh-colored. 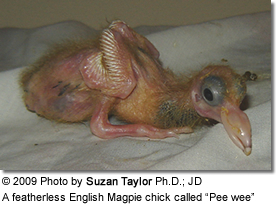 Suzan Taylor Ph.D.; JD - a dedicated magpie lover and rescuer in California, describes her experience with an English Magpie as she was sick and the English Magpie that came into her life unexpectedly stayed next to her bed for three days until she got better. In her words, he changed her whole life. He lived in the drawer next to her bed and in the morning he would wake up and jump on her chest and start grooming her and kiss her." Since this first magpie she has added several of them to her family. Please refer to below photos.